The Center for Oil and Gas at the Energy & Environmental Research Center (EERC) is a specialized technical group focusing on design and implementation of new approaches to the exploration, development, and production of oil and gas. Practicing under the long-standing EERC philosophy of collaboration and an interdisciplinary approach, the group’s success is based on developing effective partnerships with the oil and gas exploration and production industry and government agencies. 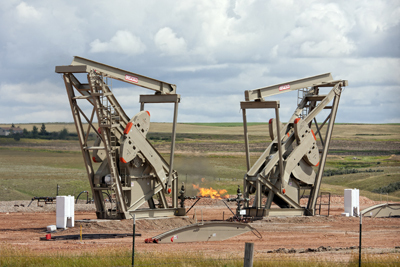 The EERC, in close coordination with Continental Resources, Inc., and several of the Williston Basin’s premier operating companies, is engaged in a research program with the goal of simultaneously improving Bakken system oil recovery while reducing its environmental footprint. To track the rapid growth in the Bakken, the EERC developed a Web-based geographic information system (GIS), the Bakken Decision Support System (BDSS), which conveniently assembles data for the Bakken and Three Forks Formations into a GIS application enabling users to visualize geologic and production information. The EERC is conducting a multidisciplinary research program with the ultimate goal of providing industry with insight regarding the potential to use CO2 for EOR in the Bakken and Three Forks Formations. This research program is being conducted in two phases. Section 8 of North Dakota House Bill 1358 directed the Energy & Environmental Research Center (EERC) to study the key aspects of gathering pipelines in North Dakota. Specifically, the EERC evaluated existing regulations on construction and monitoring of crude oil and produced water pipelines, determined the feasibility and cost-effectiveness of requiring leak detection and monitoring technology on new and existing pipeline systems, and wrote this report with recommendations to the North Dakota Industrial Commission (NDIC) and the Energy Development and Transmission Committee (EDTC).